With week 2 in the books for the Canadian prep schedule and high school tournaments, it is time to look back on who has proven what after yet another week of exciting basketball. This week we have a few public high schools making the leap from the bubble to the top 25, while a few prep programs became casualties of either a light schedule or losses. Keep in mind that moving forward for the rest of the season, programs and schools will be judged first and foremost on their performances this past week, hence the term weekly power rankings. All other categories such as pedigree, performances, and overall record will be considered, but not as heavily as what had transpired from this past week specifically. Orangeville Prep may have only played one game this week, but we didn’t see any reason in that game to not give them the number one ranking for the second week in a row. Jevonnie Scott finished with a game high 26 points against Central Tech, while continuing to look like a the high level division one prospect many college coaches had been predicting. Shemar Rathan-Mayes also added 21 in the win. With that, Orangeville Prep continues to remain undefeated against Canadian High Schools and Prep programs this season. CTA had their first look of competition this year, and it was straight into the fire at the Covenant College Prep Showcase in Neptune, New Jersey. Despite being without some starters, CTA managed to pull out a win over Rocktop Academy, before falling to the hosts Covenant House and St. Patrick’s. Ankit Choudhary had 13 in the win over Rocktop, while Ali White finished with 14 in the loss to St. Patrick’s. To be the man, you have to beat the man, and RISE Prep beat everyone they laid their eyes on in the Humber Classic Invitational this past weekend. Not only claiming gold, but knocking off two top five opponents on the way to doing it. The three-headed-monster of Josh Noton, Miguel Tomley, and Rahmir Moore were more than enough on this weekend to give RISE Prep their first ever gold at the 38th annual event. Following that, they had an impressive showing in league play with a 97-79 win over another top 25 ranked team. After being battle tested by Orangeville and a trip to the Bahamas early on in the season, this team is now firing on all cylinders just as it’s league schedule ramps up for the rest of the month. Despite a dominating performance from Jaden Bediako in the paint for all of the Humber Classic this past weekend, it just wasn’t enough to claim gold. Ridley is still one of the top teams in the country, and will likely be hovering around the top five for most of the season, but an even more impressive showing from RISE Prep has them slipping one spot to number 4. Crestwood also slipped a spot in the rankings thanks to the meteoric rise of RISE Prep. Regardless, it was still an impressive showing at the Humber Classic without their star Jahcobi Neath who just committed to Wake Forrest after going on a official visit. Kobe Antwi picked up the scoring for Crestwood near the end of the tournament, and solidified their spot in the top 5. Edge continue to represent throughout league play as coach Adam Huffman has yet to lose in almost a year and a half (regular season). 2019 Manyang Tong is also coming alive for the team out of Calgary as he posted 12 points, 3 steals and 3 assists. Edge have won their four games by an average of 20.75 PPG. Halifax prep continue to push through what is a remarkable 2nd season. As the team continues to gel together this past week they were able to beat out Lee Academy, a big accomplishment for the boys out east. A dominating performance in league play has FHC still sitting comfortably at the eight spot. Jalen Menzies continued his breakout year with a 17 point performance while Caleb Johnson was right behind him with 16. Two solid wins for the Thornhill school has them back above .500 in league play and one spot up in our power rankings from last week. Up next for them will be the biggest test they’ve faced all year in Orangeville Prep on November 22nd. TBA took care of business in league play defeating BEAST comfortably behind 25 points from Amir Gholizadeh. TBA will enter match-ups with CTA and Crestwood in league play which will definitely answer some questions about if they are top 5 material in the country. Defending home court always counts for something, and when you defend it by an average of 32 points in victory margin, that’s something else entirely. After claiming the Preston-Thorne Memorial Tournament on their homecourt, Pine Ridge is looking like a runaway freight train in OFSAA play, and that’s why they’ve moved up a spot. Defeating a top ten team, while also doing it with a depleted lineup, and then having a respectable showing against the hottest team in the top 25. This was more than enough reason the move LBA up after their performance at the Humber Classic. Yes, King’s Christian lost their only game this past week by double digits, but once again, it was to a higher ranked team that has clearly figured something out. This Oakville team still has plenty left to prove, and if they extend a two game slide to three in league play, then adjustments will have to be made. Going winless in a week is never a good thing, and that reflects TRC’s ranking right now for this week’s power rankings. Viktor Nausedas was still a force to be reckoned with against LBA, but it wasn’t enough to keep TRC from slipping out of the top ten. Even so, this is a team that has proven time and again to never be counted out as long as there is still ball left to be played. A solid win over Vaughan has brought Lincoln Prep back to .500 in league play, and with that, a chance to move up in the power rankings this week. Tyler Sagl is continuing to shoot the lights out for the Huskies, and it will remain to be seen if they can continue this two game win streak they have going after a gauntlet of top level opponents from the start of the season. Vaughan had a respectable showing in the Humber Classic, beating who they were supposed to beat, while also making a game of it against some top ten opponents. Despite the near upset over Crestwood, Vaughan will have to be content this week with moving down a spot in the power rankings after a loss to lower ranked Lincoln. A couple of losses in league play has Central Tech slipping just a little in our power rankings this week. With a couple of big matchups scheduled for week 3 against Ridley College and King’s Christian, a couple wins here could have them back in the thick of things for the top 15 in the country by next week. SBA continues to show well for a first year program getting the job done against Northstar in league play. Aliou Sesay and Cole Newkirk continue their top notch performances recording 19 points a piece. Sesay also contributed a season high 8 steals and is here to show he is a top tier PG in the country. Oakville Prep was still in the search of their first win on the season heading into the Humber Classic Invitational, and they left North Campus with just that. They also left with a rough loss to Vaughan, but also a respectable showing against LBA which saw them leading with 7 minutes left in the fourth, before London made a final push. Jordan Persad had an outstanding tournament for his club, including 38 points in their first win of the year over GTA Prep. In a week that had a lot of Prep and HS teams resting, St. Francis Xavier made the most of it and came away with the Humber Classic Invitational Gold in the high school division. They were matched up against some of the best Peel and Toronto schools in the region, and defeated everyone they came across, mostly in blowout fashion. As the season continues, it will be interesting to see if this team will be able to keep up this momentum to qualify for OFSSAA once more. Why move a team up one spot after not winning a single game this week? When you face two top five teams back-to-back along with the lack of scheduled games for other teams in this section of the power rankings, it becomes a no doubter. GTA Prep was in the tougher division at the Humber Classic compared to some of the other teams below them on the rankings this week. If you had gone to watch those games this past weekend, I doubt you would argue that despite the losses, GTA Prep deserves to stay above some of the newcomers to the power rankings this week. Rothesay’s record could easily be very different from the one they have. With two one point losses against a top 10 and top 15 team, RNS could be primed for a big jump in the rankings throughout their next few league games. With two impressive wins in the HS division of the Humber Classic, while also nearly taking out ROPSSAA rival Xavier for the gold, d’Youville has earned their first appearance on the NPH Top 25 Power Rankings here in Week 2. The impressive shooting of Rashaan Tapper, and defensive work on the perimeter from Alvin Onabolu, were a big reason The Panthers claimed silver at The Nest in North Campus. If for nothing else, Cathedral did not look that bad in their loss for Pine Ridge when you consider it was their third game all year. The Gaels will continue to get better throughout the season and are primed for another GHAC and OFSSAA run. 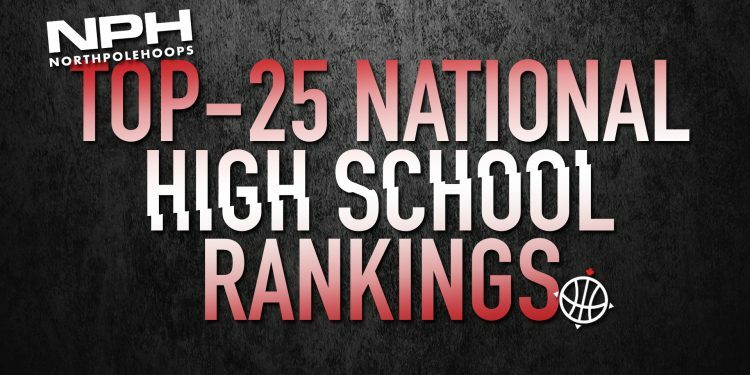 BC Christian rounds out the top 25 as they have one of the biggest teams in the country. It will be interesting to see if this group play in any big Canadian Tournaments as they have competed well internationally.